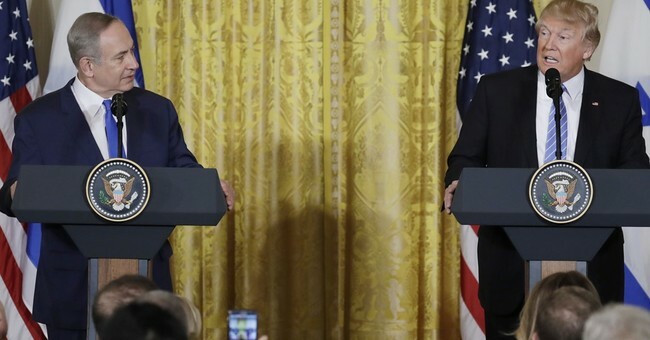 Speaking from the East Room of the White House Wednesday President Donald Trump held a joint press conference with Israeli Prime Minister Benjamin Netanyahu, indicating the era of harsh tension experienced during the Obama administration is over. "There will be lots of love, I can promise you that," Trump said. "With his [Netanyahu's] visit, the White House reaffirms the unbreakable bond with our cherished ally Israel. The partnership of our two countries build on shared values has advanced the cause of human freedom, dignity and peace. These are the building blocks of Democracy." Early on in the press conference Netanyahu joked about "The Art of the Deal" and the two leaders traded laughs, handshakes and compliments before moving onto serious issues. "Like in every negotiation both sides need to make compromises," Trump said about a Middle East peace agreement, adding that any solution reached between the Israelis and Palestinians is supported by him, two-state or not. "The Israelis are going to show some flexibility, which is hard, it's hard to do." "I'd like you to hold back on settlements for a little bit," Trump continued, adding that in order for there to be peace, Palestinians must stop promoting hate and terrorism among their people. "Our administration is committed to working with Israel and our common allies in the region toward greater security and stability. That includes working toward a peace agreement between Israel and the Palestinians." "The two prerequisites for peace are the recognition of a Jewish state and Israel's security needs west of the Jordan [river]. They remain pertinent," Netanyahu said. "I believe the great opportunity for peace comes from a regional approach and involving our new found Arab partners in pursuit of a broader peace and peace with the Palestinians. I greatly look forward to discussing this in detail with you, Mr. President because I think if we work together, we have a shot." On Iran, Trump said the nuclear agreement signed under President Obama is the "worst deal he's ever seen." He warned more sanctions like the ones recently placed on the regime for terror funding and ballistic missile tests are an option in the future to deter bad behavior. Netanyahu expressed expectations of the United States working with Israel to confront Iran's emboldened and continued aggression in the region, adding that action against Iran is long overdue. He also said stopping the regime from obtaining a nuclear bomb and arsenal is the top priority. "President Trump has led a very important effort in the past few weeks, just coming into the presidency, he pointed out the Iranian violations on ballistic missile tests, by the way, these ballistic missiles are inscribed in Hebrew 'Israel must be destroyed,'" Netanyahu said. "I think that if we work together, and not just the United States and Israel but so many others in the region who see eye-to-eye on the great magnitude and danger of the Iranian threat, I think we can roll back Iran's aggression and danger. That's something that's important for Israel and the Arab States but I think it's vitally important for America." When asked about the progress of moving the U.S. Embassy in Tel Aviv to Jerusalem, Trump said logistics and options are still being evaluated. "I'd love to see that happen, we're looking at that very, very strongly, we're looking at that with great care, and we'll see what happens," Trump said.